90:00+4:14 The referee signals the end of the game. 90:00+3:51 Yoann Arquin gives away a free kick for an unfair challenge on Barry Bannan. Free kick taken by Barry Bannan. 90:00+3:42 The ball is delivered by Habib Beye, Michael Townsend manages to make a clearance. 88:32 Substitution Stuart Fleetwood goes off and Tom John comes on. 88:32 Andreas Weimann takes a shot. 87:04 Stephen Ireland provided the assist for the goal. 87:04 GOAL - Nathan Delfouneso:Aston Villa 2 - 0 Hereford Nathan Delfouneso scores a headed goal from deep inside the penalty area. 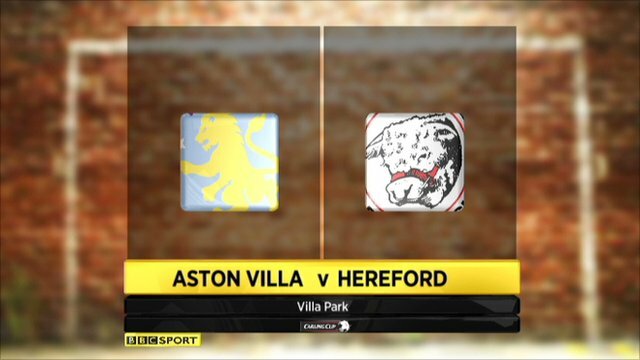 Aston Villa 2-0 Hereford. 86:53 The ball is swung over by Marc Albrighton. 86:25 Marc Albrighton takes a short corner. 86:25 Substitution Habib Beye joins the action as a substitute, replacing Chris Herd. 84:34 Marc Albrighton takes a shot. Save by David Cornell. 82:30 Corner from the right by-line taken by Barry Bannan, Chris Herd challenges Joe Heath unfairly and gives away a free kick. David Cornell restarts play with the free kick. 81:02 Free kick awarded for an unfair challenge on Joe Colbeck by Barry Bannan. Ryan Green takes the free kick. 79:22 GOAL - Eric Lichaj:Aston Villa 1 - 0 Hereford Eric Lichaj gets on the score sheet with a goal from close range high into the middle of the goal. Aston Villa 1-0 Hereford. 79:01 Inswinging corner taken from the left by-line by Marc Albrighton. 78:08 The ball is crossed by Joe Colbeck. 76:56 Nathan Delfouneso produces a right-footed shot from deep inside the penalty box which goes wide of the left-hand upright. 76:11 Daniel Williams restarts play with the free kick. 76:11 Booking The referee cautions Andreas Weimann for unsporting behaviour. 75:55 Unfair challenge on Harry Pell by Andreas Weimann results in a free kick. 75:19 Barry Bannan takes a inswinging corner from the right by-line played to the near post. 72:59 Free kick awarded for a foul by Stuart Fleetwood on Chris Herd. Free kick taken by Bradley Guzan. 72:48 Joe Colbeck sends in a cross, Bradley Guzan makes a save. 71:01 Substitution Andreas Weimann on for Darren Bent. 71:01 Substitution Yoann Arquin comes on in place of Delroy Facey. 70:36 Corner from left by-line taken by Joe Colbeck. 69:52 Joe Colbeck crosses the ball in from the free kick, Richard Dunne makes a clearance. 69:52 Booking The referee books Eric Lichaj for unsporting behaviour. 69:38 Free kick awarded for an unfair challenge on Harry Pell by Eric Lichaj. 68:28 The ball is sent over by Marc Albrighton. 68:02 Outswinging corner taken left-footed by Barry Bannan from the left by-line to the near post, Kenny Lunt makes a clearance. 67:56 Barry Bannan crosses the ball, Kenny Lunt manages to make a clearance. 65:40 Joe Colbeck takes a shot. Save made by Bradley Guzan. 64:41 Unfair challenge on Michael Townsend by Darren Bent results in a free kick. Free kick taken by Ryan Green. 62:45 Marc Albrighton challenges Kenny Lunt unfairly and gives away a free kick. The ball is swung over by Joe Colbeck, Nicky Featherstone produces a header from deep inside the six-yard box which goes wide of the right-hand upright. 61:26 Outswinging corner taken from the right by-line by Joe Colbeck. 60:50 Centre by Chris Herd. 59:31 Substitution James McQuilkin leaves the field to be replaced by Kenny Lunt. 59:16 Header from close in by Stephen Ireland misses to the left of the target. 57:57 Substitution Nathan Delfouneso is brought on as a substitute for Charles N'Zogbia. 57:50 Charles N'Zogbia has an effort at goal from outside the box which goes wide right of the goal. 56:04 Unfair challenge on Harry Pell by Eric Lichaj results in a free kick. David Cornell takes the free kick. 55:34 Charles N'Zogbia fouled by Daniel Williams, the ref awards a free kick. Marc Albrighton delivers the ball from the free kick right-footed from left wing, save made by David Cornell. 52:37 Corner from the right by-line taken by Barry Bannan, Headed effort from close range by Richard Dunne goes wide left of the goal. 52:24 Eric Lichaj takes a shot. Save by David Cornell. 52:06 A cross is delivered by Marc Albrighton, Ryan Green makes a clearance. 46:47 Harry Pell fouled by Marc Albrighton, the ref awards a free kick. David Cornell takes the free kick. 46:00 Foul by Ryan Green on Darren Bent, free kick awarded. Barry Bannan takes the free kick. Correction - 45:34 Delroy Facey challenges Chris Herd unfairly and gives away a free kick. Direct free kick taken by Bradley Guzan. 45:34 Delroy Facey challenges Chris Herd unfairly and gives away a free kick. Bradley Guzan takes the direct free kick. 45:00+1:16 The ref blows to end the first period. 41:09 Darren Bent takes a shot. David Cornell makes a save. 40:33 Centre by Eric Lichaj, clearance by Ryan Green. 40:09 Delroy Facey concedes a free kick for a foul on Eric Lichaj. Direct free kick taken by Eric Lichaj. 39:12 The ball is sent over by Eric Lichaj, Barry Bannan has an effort at goal from deep inside the area missing to the left of the target. 38:13 Effort from outside the penalty area by Nicky Featherstone goes wide left of the goal. 37:36 James McQuilkin fouled by Jean Makoun, the ref awards a free kick. Direct free kick taken by Michael Townsend. 35:05 Corner taken by Barry Bannan from the left by-line, clearance by Delroy Facey. 34:52 Stephen Ireland takes a shot. Save by David Cornell. 33:39 Foul by Charles N'Zogbia on Harry Pell, free kick awarded. Direct free kick taken by Michael Townsend. 32:44 Unfair challenge on Nicky Featherstone by Marc Albrighton results in a free kick. David Cornell takes the direct free kick. 31:23 Marc Albrighton crosses the ball, save by David Cornell. 29:13 Handball by Stephen Ireland. Direct free kick taken by Daniel Williams. 28:09 Long range shot from Barry Bannan misses to the left of the goal. 25:50 James McQuilkin produces a cross. 23:37 Charles N'Zogbia delivers the ball, Header from deep inside the penalty area by Chris Herd goes harmlessly over the crossbar. 23:06 Outswinging corner taken from the left by-line by Barry Bannan. 22:49 Ciaran Clark takes a shot. David Cornell makes a save. 21:45 Corner taken left-footed by Charles N'Zogbia from the right by-line to the near post, Nicky Featherstone manages to make a clearance. 19:49 The ball is sent over by Marc Albrighton. 16:09 Unfair challenge on Stuart Fleetwood by Ciaran Clark results in a free kick. Harry Pell takes the free kick. 15:52 Marc Albrighton delivers the ball, save by David Cornell. 14:32 Darren Bent is caught offside. David Cornell restarts play with the free kick. 13:18 Harry Pell takes a shot. Bradley Guzan makes a save. 8:07 The official flags Darren Bent offside. David Cornell takes the free kick. 7:53 Barry Bannan takes a shot. Blocked by Nicky Featherstone. 2:43 Close range headed effort by Chris Herd goes wide of the left-hand post. 2:11 Foul by Delroy Facey on Chris Herd, free kick awarded. Barry Bannan restarts play with the free kick. 1:32 Harry Pell fouled by Jean Makoun, the ref awards a free kick. Free kick taken by James McQuilkin.